Stunning Clear Quartz Crystal Point Pendant capped with silver foil from Brazil. Stunning Clear Quartz Crystal Point Pendant capped with silver foil from Brazil. 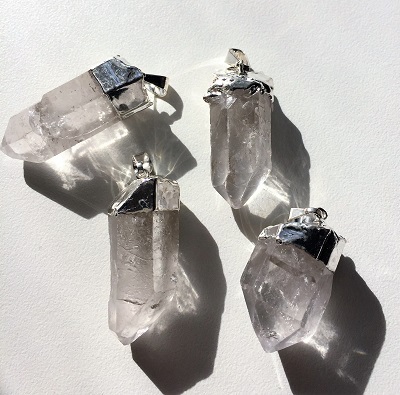 Clear Quartz amplifies energy and may be a helpful crystal tool for meditation, spiritual development and healing. 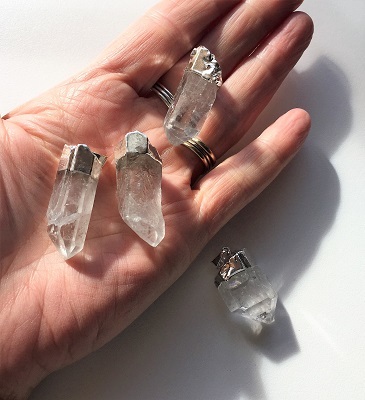 Quartz Crystals have been used in diagnostic healing, in raising the consciousness toward the enlightened state, and in communicating with spirits and from those from other worlds. Quartz crystal works at a vibrational level attuned to the specific energy requirements of the person needing healing or undertaking spiritual work. 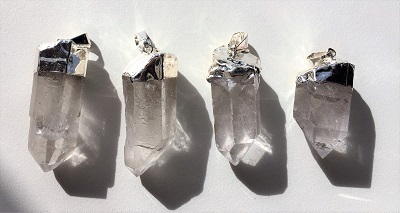 Quartz crystal raises energy to the highest possible level, works on all level of being, connects to all chakras and enhances psychic abilities and attunes one to one’s spiritual purpose. Quartz is a master healer; it stimulates the immune system and brings the body into balance.